The author's pragmatic intention with Machine Designers Reference is a volume that supports and compliments today's software programs and the Internet links most commonly relied upon by mechanical designers in the field. At the same time, the book is exceptionally useful to mechanical engineering students and fresh graduates seeking to excel at the curriculum or advance their career in design. 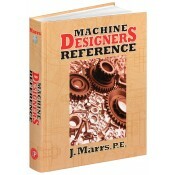 Machine Designers Reference complements the coverage offered by standard textbooks in the field. It serves effectively as a bridge between the academic experience and practical design employment in the industry. Jennifer Marrs, P.E., is a mechanical design engineer. For two decades, her focus has been the design and analysis of high-speed assembly machines and related systems. She has also worked as a product designer, manufacturing engineer and forensic engineer. She is pictured here with the off-road vehicle she built by hand, a genuine labor of mechanical love. "I have an idea for a companion to Machinery's Handbook.... a Toolbox that contains items I've... squirreled away over my years of machine design. These are items that the working machine designer uses just about every day." Good book - glad I found it! When will the next edition come ..